Opens at Easter. Friendly welcome. 5 minutes from A1(M) Junction 51. 5 minutes from market town of Bedale. Easy access to heart of Yorkshire Dales. On edge of village with 5 minute walk to village green with pub, cricket ground, quoits pitch, church, petrol station and village shop. Regular local league cricket matches and annual charity match Emmerdale All Stars v Crakehall. 2018 sees Stage 3 of Yorkshire’s great cycle race come through the village on Sat 5 May. Restored historic watermill on site – producing stoneground wholemeal flour. Mill open for tours on 1st Sunday of month April-October. 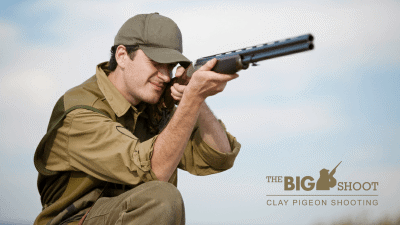 - Coarse and fly fishing available within 3 miles. 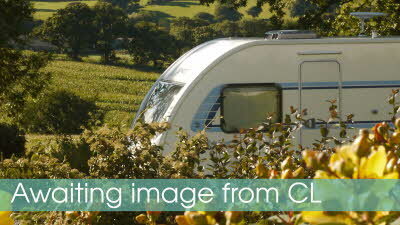 - Holiday cottages to let. 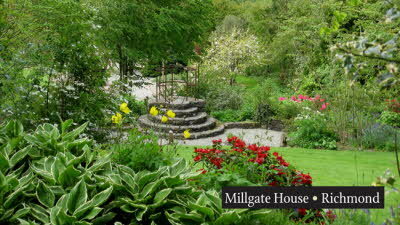 Millgate House is located in Richmond, one of the most beautiful, rugged and remote towns of the Yorkshire Dales. The stunning gardens are national award winning and were selected by Alan Titchmarsh for 2015 as one of Britain's top 30 gardens. We stayed here for 2 nights on our way up to Northumberland. Narrow access to site and site very sloping. Dog friendly pub within walking distance. Road noise wasn't an issue as we went out in the daytime and was quieter in the evening. There was also a dog walk next to the site. 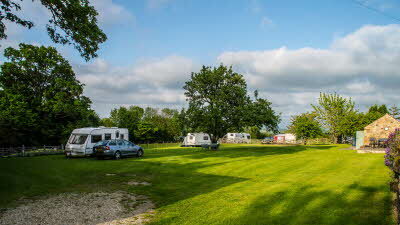 This is a well kept site and the friendly owner meets you on arrival and explains the site facilities. 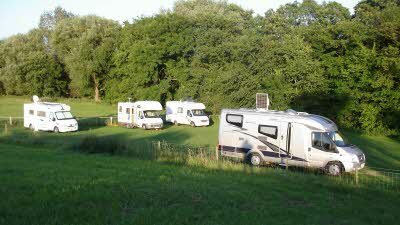 Some pitches will require levelling blocks and on pitch 4 you may require a step to help you out of your motor home. The area is good for footpaths and you can easily get onto quiet lanes that are suitable for cycling. My one minor point is the traffic noise during the day, it's not over intrusive but is present during daylight hours. 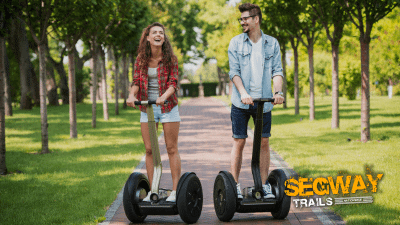 The owners are very friendly and informative and give you a lot of information regarding the surrounding area when you make your booking. Sav Nav takes you direct to the site. Access to the grass field (there are no hard standing pitches) is down a narrow driveway passed the owners B&B and cottages. The field is very sloping and levelling blocks are essential. There is a toilet on site which doubles as an information centre. The waste disposal and recycling bins are beside the toilet along with one of the drinking taps. Some of the pitches have their own water tap. We were on pitch 5 which didn’t have it own tap and was a fair distance from the electricity. We had to borrow a further cable from the owner to be able to connect our motorhome. 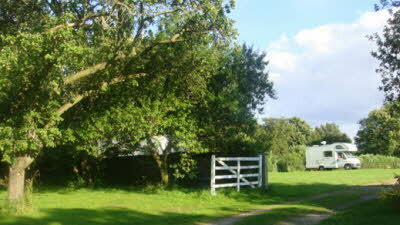 There is a public footpath that runs around the site which is a pleasant walk (providing it hasn’t been raining). There is also a dog friendly pub near. The slight downside to this site is the price £15 per night which I feel is quite expensive for a CL however saying that it would not put me off staying here again. Lovely peaceful site. 10 minute walk to a great dog friendly Pub. Fish and Chip night on Friday, really good! 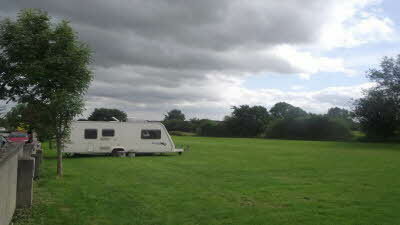 Field slopes a little we had a quite a step up into the caravan but well worth it, levelling blocks required. We had a very interesting guided tour of the Watermill a bargain at £3 each. We will definitely be going back.